With Sony taking a tentative step into virtual-reality gaming with this week’s introduction of its Project Morpheus headset for the PlayStation 4, the founder of startup Oculus had a message for its new rival in the VR headset market: The more, the merrier. 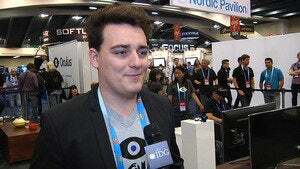 “It’s really cool to see other people entering the VR space,” Palmer Luckey said in an interview at the Game Developers Conference in San Francisco on Wednesday. “We’ll see when we know more about the price, weight, when it’s shipping, stuff like that,” he added, referring to the lack of details forthcoming from Sony. The gadget Sony launched on Tuesday is a prototype that’s been under development for three years at the Tokyo company, which intends to offer it to game developers at an unannounced later date. Luckey’s point, that Sony’s entry into virtual reality will propel development in the space, could be correct. Conversations with a handful of developers who had tried one or both headsets at the event revealed they are all excited about building virtual reality into their games. “I think it’s the last big thing in gaming,” Luckey said. “If you can have perfect virtual reality, and we’re not perfect, but if you can get there, what other simulation could there be? “That’s super corny and lame to say, because people will make new games and new game play ideas, but in terms of hardware and hardware improvements, VR will eventually be the final step,” he said. Visitors to the Game Developer Conference in San Francisco try out an Oculus Developer Kit 2 headset. At the event, Oculus released a new version of its hardware. Dubbed “development kit 2,” the new headset features a high-definition screen, improved orientation tracking and other enhancements. It will ship to developers in July for $350. There’s no word on when a consumer version will be available. Looking into the future, and closer to that point of perfect virtual reality, Oculus is working on developing a completely self-contained headset. Right now, the device needs to be connected to a powerful PC or console for its graphics, and that means a cable. “Mobile is the long-term future of VR — having mobile chipsets embedded into the headset itself—but right now they’re not powerful enough to provide the kind of experience that you want to have in VR,” he said.